Twenty five years ago, Filipinos went to the streets filling Epifanio de los Santos Avenue. By the thousands, they came. Through EDSA, we changed history, democracy and the meaning of revolution forever. We showed the world that we are a race of warriors ready to brave tanks and armed soldiers with nothing but ourselves and prayers. This battle in 1986, was not a battle of armed conflict but a battle of will, solidarity, conviction, unity and faith. It was the day we choose to stand up for who we believe in, and it was monumental. The story has been retold over and over again. Even the inside story has been told, the political struggles, the interplay of power to those in position. Still a nation has been moved, a nation has been changed, a nation has chosen. Well, technically...just the residents of Metro Manila and a few from Luzon did. 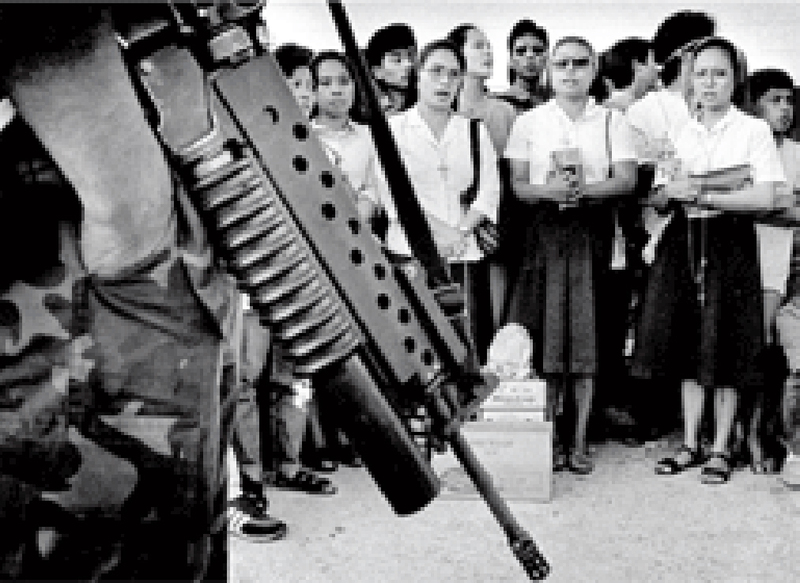 EDSA now became a symbol of resistance, reforms, and democracy. And also peace. Whenever there's a need for radical change, it is being taken to the streets. Thus a couple more "EDSA's" followed. But those that attempted to repeat 1986, they never came close to the real thing. The question is, after 25 years, what good did the EDSA Revolution do to our country? Did it just seal the lid on our title as being peaceful revolutionaries? Our National hero, Dr. Jose Rizal believed in peaceful revolutions. Perhaps the EDSA Revolution resulted partly in his works. 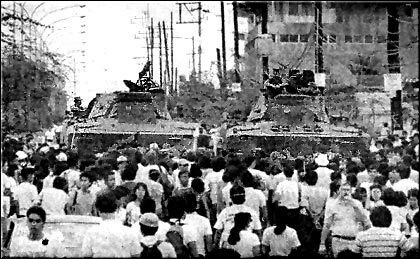 Update: Check another article I wrote regarding EDSA Revolution. Read it here. 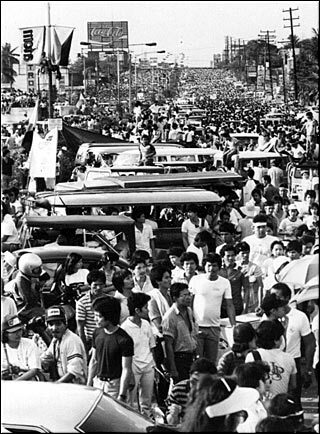 Another Perspective of People Power and the EDSA Revolution. For every man, there is a woman. To how he gets to the woman, it is a challenge and a quest. For us Filipino, we have something, but that something is fast sliding into forgotteness. In the days of old, our women, for their hearts to be won, tradition must be followed. Tradition encouraging romance, respect, and courtship.With the rise of technology, tradition gradually changed, and with it fades the courtship practice of Pinoys. 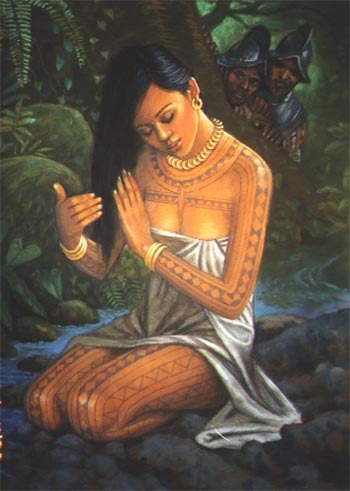 Harana may still be here, but perhaps in the next generation it could totally disappear. If the suitor is acceptable for the girl she will let the men in the house, or let them stay outside and she responds with a song. All these may happen under the watchful eye of the parents. Presently, the tradition is almost non existent. Gone are the men, getting together over tuba or some liquor, practicing and singing to help a fellow in his quest for love. For a Pinoy to be truly a man, one must win the heart of his irog (loved one). The cool evenings, the sweet voice, the gentle strumming of the guitar and a heart warming song offered to a lady. For sure, all of these can cause more than just a smile from her. Update: To know how it really is to serenade, read this article. Paano ba talaga mang-Harana? Cooking it is the most mouth-watering experience, both for the cook and for the nakiki-amoy. Eating, brings you to an experience hundreds of years old, inherited from tradition. Only in the Philippines, the Pinoy Adobo. Adobo means sauce or marinade in Spanish. When the colonists arrived, they found our ancestors stewing meat in vinegar and all the good stuff, and since it has funny looking but superb tasting sabaw (sauce), they called it sauce in Spanish! What a way to call a dish! These "wiseguys" has been making the same mistake over and over again all over the world, and the true name of our favorite dish has been lost forever. Good thing, cooking it is still basically the same as it was before. At least the flavor is still somewhat the same. Marinating meat in salt and vinegar, boiling it for hours seemed really traditional in the 1500's. 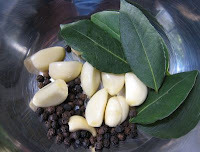 Adding garlic, peppercorns and bay leaves belongs to the 1800-1900's. 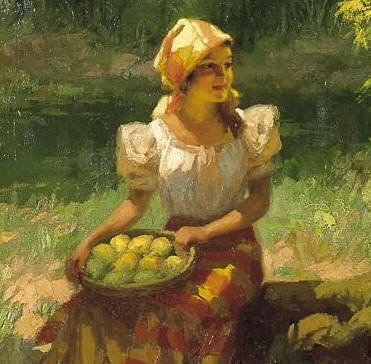 But whatever is added to it, the adobo brings you back to the past through your palette. Hundreds of years ago, no refrigeration, no means of preservation and in times of plenty, lots of meat. So our ancestors improvised, and it turned into one tasty dish. As they say, the Pinoy adobo tastes better as it ages. Vinegar and salt inhibits the growth of bacteria, and meat boiled and swimming in its own fat is like meat swimming in preservatives in a natural way. Eating it off the stove, which on my opinion, cannot be avoided due to the mouth watering nature of an adobo is already superb. But giving a few days wait definitely makes it all worth it. All the flavors wonderfully blended in, everything almost perfect. You may not want to stop eating. Be sure to cook lots of rice to go with adobo. A Filipino faced with rice and adobo won't talk a lot, just eat a lot. A hearty ulam (viand) for a hearty warrior, the Pinoy Warrior. More rice please! Update: How to cook adobo, read it here. 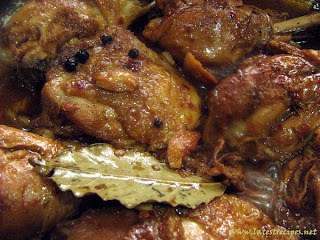 Adobo ulet anyone? Regarded as one of the World's most beautiful, the Filipina stands out in beauty and in form. There is a distinct allure, a distinct charm belonging only to the Pinay. The Pinoy Warrior is fierce and brave because of among other things, a Filipina. 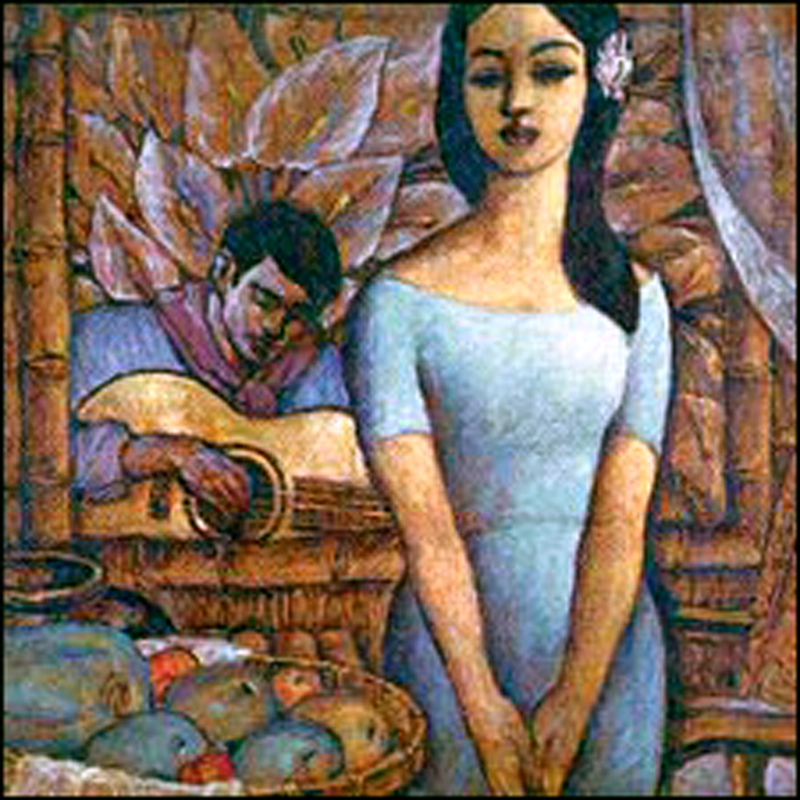 We all grew up thinking of the Maria Clara image of a Filipina, as popularized in the novels of Rizal. The baro and the saya, worn by the Pinays are still the classic image of our women. Covered by the pañuelo(piano shawl), it is a sight to behold, and truly captivating. But there's more to it than meets the eye. Although, what the eye see are things really hard to ignore. They have the most perfect skin color, not too dark, not too light. The envy of the caucasian women, the permanent "tan," that glows and shines in the sun. 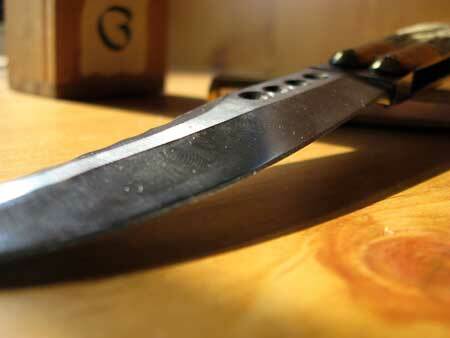 They have long black hair, as dark as the night, thoroughly cleansed and fragrant. We are a race of people who take great lengths to be hygienic and healthy, and our women take it more seriously. Proof of Pinay beauty? Our country, with the very few of the world, share a spot as among the favorites of the Miss Universe beauty pageant.. Perhaps because the Pinays fall on their long gowns face down on stage... yet rise gracefully again. Two Miss Universe crowns can give you a good reputation. Making it on the semi-finals frequently is another thing. Almost getting the crown but missing the mark is still well, prestige. Major, major prestige. Everyone knows the story. The TVs, the papers and the net, it was all over. It was Major, major highlight on the Filipinas. And except for the final moments, everyone placed their bets on a Pinay. World class we are, but like everything else in the Philippines, we need to learn more. But wait a minute, maybe the whole world was looking at it wrongly. Maybe the whole world got its standards messed up. That is why we fall "short." We are really good on a lot of things. Sometimes, we are good on the not-so-important-things. But when the not-so-important-things become important, we become POP-A-SHOT CHAMPIONS. And we show the world how to shoot some hoops. He doesn't look like someone who plays basketball, except for the skin head i suppose. But he doesn't look like he can outshoot the pros. Well, well, well. 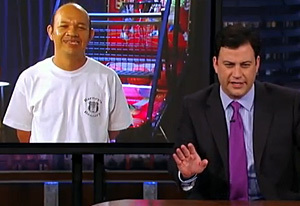 Jimmy Kimmel did find something curiously different. Ricardo Reyes. A bus boy. I've seen the likes of him on the video arcades of malls here in Metro Manila. They should visit. Not just Lebron...even Kobe gets a surprise.